In early 1942, as the list of military defeats and reversals for the Australian, British, American and Dutch military and naval forces began to mount, the feeling in the general populace of Australia was one of depression and a general expectation that the Japanese would invade at any moment. Almost as if aware of these fears, the Japanese were, by April 1942, examining the possibility of capturing Port Moresby, Tulagi, New Caledonia, Fiji and Samoa. The object of this plan was to extend and strengthen the Japanese defensive perimeter as well as cutting the lines of communication between Australia and the United States. The occupation of Port Moresby, designated Operation MO, would not only cut off the eastern sea approaches to Darwin but provide the Imperial Japanese Navy with a secure operating base on Australia's northern doorstep. USAAF B-25B bombers on board USS Hornet for the Doolittle Raid, April 1942. While the Japanese Naval General Staff were examining options for further operations the planning staff of the Japanese Combined Fleet were doing the same, though their objectives were different. In early April 1942 the staff of the Combined Fleet had presented the Naval General Staff with a proposal for the invasion and capture of Midway Island. By this action it was hoped that the American Fleet would be enticed "into an ambush where they [the American Fleet] could be annihilated by overwhelming numbers". In essence Admiral Isoroku Yamamoto was hoping to repeat Admiral Togo Heihachiro's victory over the Russians at the Straits of Tsushima in 1905. After much haggling the two staffs agreed to go ahead with the Midway operation after the capture of Port Moresby. However, planning progressed slowly until 18 April when American B25 bombers, led by Lieutenant Colonel James H Doolittle, attacked targets in the Japanese Home Islands. The military value of this raid was minimal, "but its psychological effect on the Japanese was all that might have been desired. The army and navy had failed in their duty to safeguard the homeland and the Emperor from attack. Admiral Yamamoto regarded the raid as a mortifying personal defeat." As a result of this first air raid on Japan the Midway operation took on greater importance and Admiral Shigeyoshi Inouye, Commander of the Fourth Fleet at Rabaul, was instructed that the Port Moresby operation was to take place in early May with the Midway operation planned for the following month. "The generals and admirals had suffered a tremendous loss of face, and their angry over-reaction eventually brought a succession of strategic disasters". Had the Doolittle raid not occurred there is the real possibility that the majority of the Japanese aircraft carriers may have been involved in Operation MO. The aircraft carrier Kaga (72 combat planes) was originally allocated to take part in the operation but with the advancement of the timetable she had to be omitted as she was in dockyard hands till late April 1942. As it was, Admiral Inouye still had the aircraft carriers Shoho, Shokaku and Zuikaku. 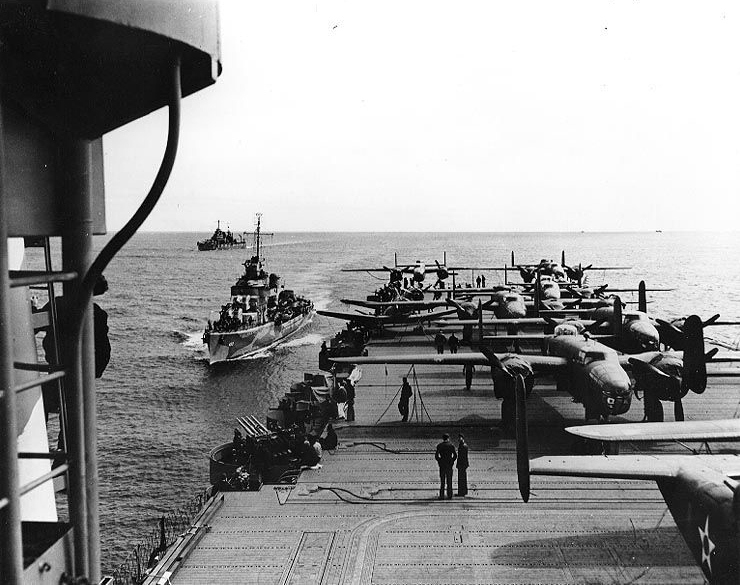 After completion of Operation MO the carriers were to rejoin the rest of the fleet and take part in the planned operations against Midway Island. The Japanese plan was to initially seize the islands of Tulagi, in the Solomons, and Deboyne off the east coast of New Guinea. The intent was to use both islands as bases for flying boats which would then conduct patrols into the Coral Sea in order to protect the flank of the Moresby invasion force. The Japanese also believed that they would be denying the Americans the use of these islands for the same purpose. The Moresby occupation force would sail after the capture of Tulagi on 3 May. As the Moresby occupation force entered the Coral Sea from the north it would be covered by the Carrier Striking Force which would enter the Coral Sea from the direction of the Solomon Islands. Prior to implementation, the operation was expanded to include the seizure of Ocean Island and Nauru after the capture of Port Moresby. Land based aircraft, under the command of Rear Admiral Sadayoshi Yamada commander 25th Air Flotilla, operating out of Japanese airfields and the newly established seaplane bases were also allocated to support the operation. Prior to the fall of the Philippines the United States Navy's (USN) signals intelligence unit at Corregidor Island, known as CAST and commanded by LEUT Rudolph J Fabian, USN, had been transferred to Melbourne and became a joint USN/RAN unit known as Fleet Radio Unit Melbourne (FRUMEL). This organisation was to play "an important part in the Battle of Coral Sea and in the Battle of Midway". On 28 March US Naval Intelligence decoded a message that stated "THE OBJECTIVE OF MO WILL BE FIRST TO RESTRICT THE ENEMY FLEET MOVEMENTS AND WILL BE ACCOMPLISHED BY MEANS OF ATTACKS ON THE NORTH COAST OF AUSTRALIA". As a consequence of the ability to read Japanese naval communications traffic the Americans were almost as well informed on what was planned as the Japanese commanders. The problem was in the correct interpretation of that information. "9th April 1942 3. C-in-C Combined Fleet today asked for a report on progress of repairs to Kaga. He requires her services as soon as possible since she is due to take part in the "RZP" campaign". (Comments 1. "RZP" is the place designator for Moresby). "4th May 1942 7. Message to 5th Cruiser Division and 5th Carrier Squadron gives the following programme for the "MO" Striking Force: On X-minus 2 or 3 day they are to - to the SE of Moresby and attack bases in the Moresby area. If the of "RX" (Solomons) and then proceed south. At 0600 on 6th May after arrival at - further orders will be issued, but if no further orders are received they are to proceed to "RBX" (Tulagi). If air search is required in the southern sectors, the 5th Carrier Division is to send aircraft to "RBX" (Tulagi) at dawn." Armed with this information the Allies were able to concentrate much of their available striking forces in the Coral Sea area. Rear Admiral John Crace, RN. As the picture of the intended Japanese plans began to develop Admiral Chester Nimitz, Commander-in-Chief of the Pacific Fleet, deployed his two available carrier groups. 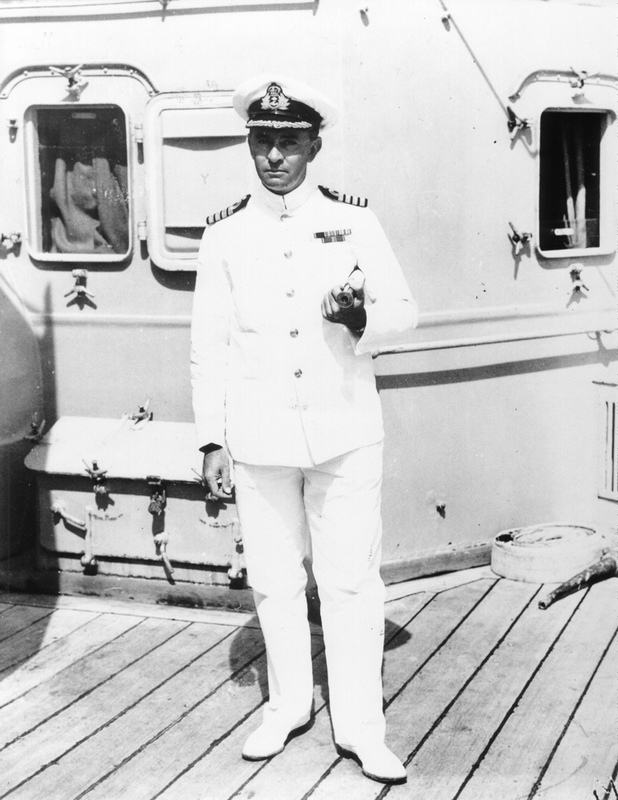 Rear Admiral Aubrey Fitch, USN, commander of Task Force 11 centred on USS Lexington, was ordered to sail and join Rear Admiral Frank Jack Fletcher's Task Force 17, centred on USS Yorktown, in the Coral Sea. The Yorktown group was returning to the Coral Sea after replenishing and conducting a short maintenance period at Tongatabu in the Tonga Islands. From the south was deployed the cruiser force, Task Force 44, commanded by Rear Admiral John Crace, RN. The Allied Air Forces, commanded by Lieutenant General George H Brett, USAAF, and consisting of Allied aircraft based in Australia and New Guinea. Rear Admiral Thomas C Kinkaid, USN. In the Pacific Fleet headquarters at Pearl Harbor a large chart of the Coral Sea area was laid out and staff commenced plotting the movements of the two opposing forces. An orange line traced the expected movements of the Japanese fleet whilst blue lines showed the converging Allied forces. After their return from the Tokyo raid Rear Admiral William F Halsey's two carriers were quickly refuelled and replenished and sailed on 30 April. The deployment and operation of the American naval forces into the Coral Sea was further complicated by the fact that the Coral Sea lay in the newly created South West Pacific Area, under the control of General Douglas MacArthur. This prevented Commander DeBaun from sending his patrol aircraft into the area where Lieutenant General Brett's aircraft were to be searching, even though "it was physically impossible for them to do it". The submarines were to patrol the coastal waters of New Guinea, the Louisiades and the Bismark Sea. Again they did not cross the demarcation line and patrol the approaches to the Solomons. Had they done so then the movements of Tagaki's carriers into the Coral Sea may have been detected. Fletcher was also reliant on MacArthur's command for the provision of timely intelligence information on the movements of the Japanese. Information from these aircraft was first evaluated by local command staff and then what they considered relevant was passed onto Fletcher. The fact that the Coral Sea battleground straddled two different operational commands did complicate matters. On 1 May, the two American carrier groups rendezvoused and began to refuel from their attendant oilers. The Yorktown group completed fuelling first and, when Rear Admiral Fitch advised Rear Admiral Fletcher that he did not expect to complete fuelling till noon on 4 May, Fletcher decided to move the Yorktown group further to the north west. He advised Rear Admiral Fitch of his intention and of a new rendezvous. The second rendezvous, set for the morning of 4 May would see the Australian cruisers Australia and Hobart join the force for the first time. As the Americans were refuelling and attempting to position themselves so that they could intercept any Japanese naval forces, Shokaku and Zuikaku were sailing from Truk and by 3 May, as the Tulagi Invasion Group was landing, were north east of Rabaul. The movement south of the Tulagi Invasion Group had been reported by a coast watcher on Santa Isabel Island, Major Donald G Kennedy. With the successful occupation of Tulagi, Operation MO was well and truly underway. On receiving advice of the landings at Tulagi, Rear Admiral Fletcher turned the Yorktown group to the north east and increased speed to 27 knots with a view to launching strikes against Tulagi on the morning of 4 May. As Yorktown headed for Tulagi, Fletcher detached the tanker, Neosho and her escorting destroyer, Russell, to rendezvous with Fitch and Crace and advise them of his intentions as well as of a new rendezvous planned for the morning of 5 May some 300 miles south of Guadalcanal. 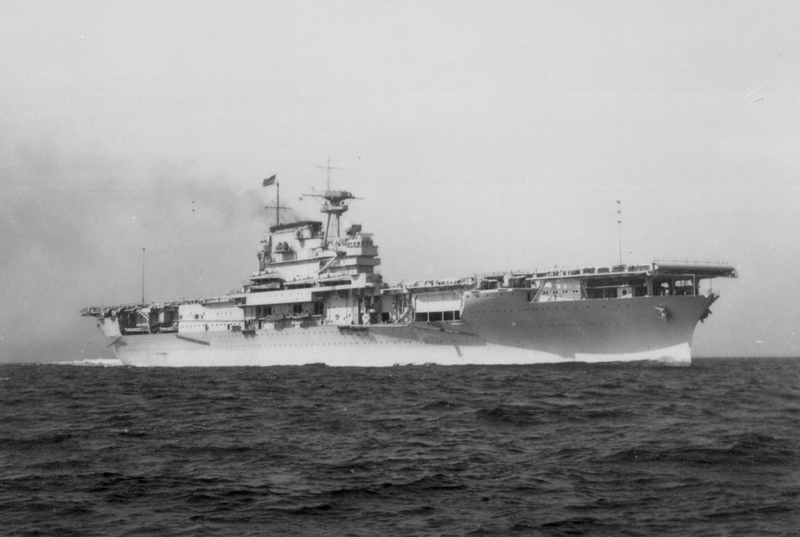 By 06:30 on the morning of the 4th, Yorktown was in a position to launch carrier strikes against Tulagi. The first strike arrived at Tulagi at about 08:15 and attacked Japanese shipping in the harbour. A total of three strikes were launched by Yorktown against Tulagi. By the end of the day the Americans had sunk the destroyer Kikazuki, four landing barges and destroyed five floatplanes whilst damaging the minelayer Okinoshima and a destroyer. All this was achieved at a cost of three aircraft, 22 torpedoes, 76 1000lb bombs and thousand of rounds of machine gun ammunition. Whilst these strikes would have confirmed any suspicions the Japanese had as to the presence of American carriers in the Coral Sea, they also destroyed the Japanese reconnaissance capability out of Tulagi and so reduced the number of long range aircraft available to the Japanese, particularly in the north east Coral Sea. 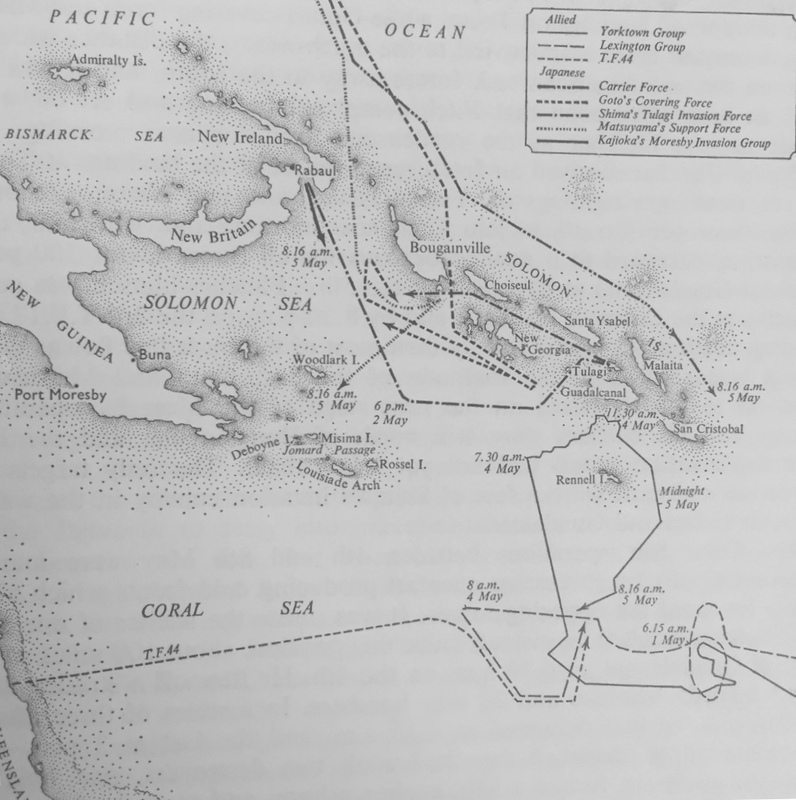 On completion of the strikes against Tulagi, Fletcher retired to the south to rendezvous with Fitch and Crace. After making the rendezvous on the morning of 5 May Fletcher commenced refuelling his ships. On completion of refuelling Fletcher headed for the Louisiade Achipelago to intercept the Japanese forces he expected to pass through there enroute to Port Moresby. Meanwhile the carriers of Admiral Tagaki's Carrier Striking Force were rounding the southern tip of the Solomons and about to enter the Coral Sea behind the American carriers. On 6 May a Japanese land based reconnaissance aircraft spotted the American carrier group refuelling but this information did not reach Tagaki until the next day. Fletcher was advised that Boeing B17 bomber aircraft had made an unsuccessful attack on Shoho, and other Japanese naval units and transports which were sighted heading south from Rabaul. Aircraft launched that afternoon by the Americans flew over the Japanese carriers without spotting them due to the heavy cloud cover. Tagaki, meanwhile, having found nothing, headed north and commenced to refuel, only 70 miles away from Fletcher's carriers. At the end of the day Fletcher, having refuelled his ships, detached the almost empty Neosho to the south with the destroyer Sims. Early on the morning of 7 May Fletcher split his force by detaching Crace and the Support Group to cover the Jomard Passage and intercept the invasion force as it exited. This was an extremely risky decision and perhaps the most important in the entire battle, for not only did Fletcher weaken his own air defences but he also exposed Crace's ships to the possibility of air attack without hope of fighter protection, as had occurred with HM Ships Prince of Wales and Repulse. HMAS Australia flew the flag of Rear Admiral Crace during the battle of the Coral Sea. Crace's cruisers arrived off the Jomard Passage at about 14:00 on 7 May. Due to the major air threat that faced the cruisers Crace ordered the ships to take up an anti-aircraft formation. Half an hour later a group of unidentified aircraft approached the ships. Not taking any chances the ships opened fire on the aircraft; no hits were registered. A short time later an American Dauntless dive bomber approached seeking information as to the location of the American carriers. As this was not known the pilot was given the range and bearing to Port Moresby. 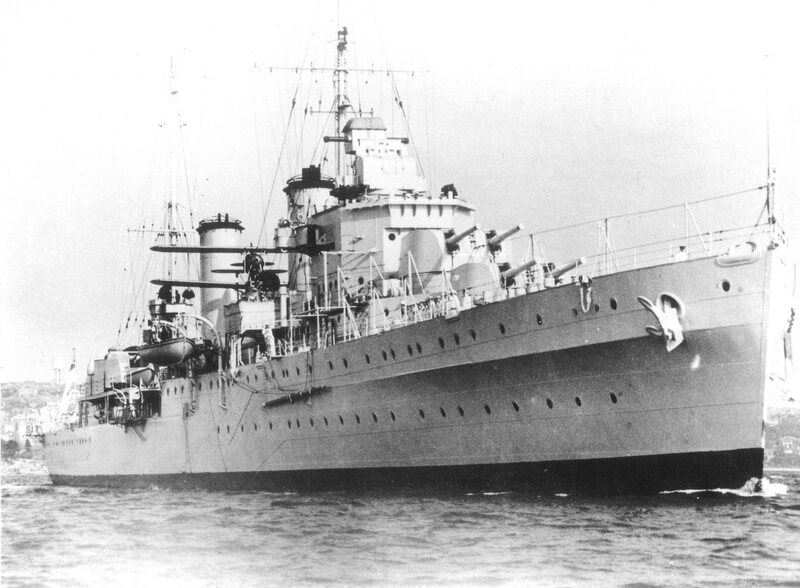 HMAS Hobart, already a veteran of the Mediterranean campaign served with distinction throughout the Pacific war. More aircraft were sighted at about 15:00 and it soon became clear that these were Japanese. Crace altered course so that the ships were heading directly towards the oncoming aircraft. In an attempt to make as difficult a target as possible, each of the ships commenced evasive manoeuvring. As the ships opened fire on the Japanese one was hit and the remainder released their torpedoes at too great a range, and with the ships still bow on to the attackers. This presented the narrowest possible target for the torpedoes, all of which, not surprisingly, missed. After releasing their torpedoes the aircraft strafed the ships. This resulted in a small number of casualties. During this brief attack the Japanese lost five aircraft, whilst others may have ditched on the return flight. 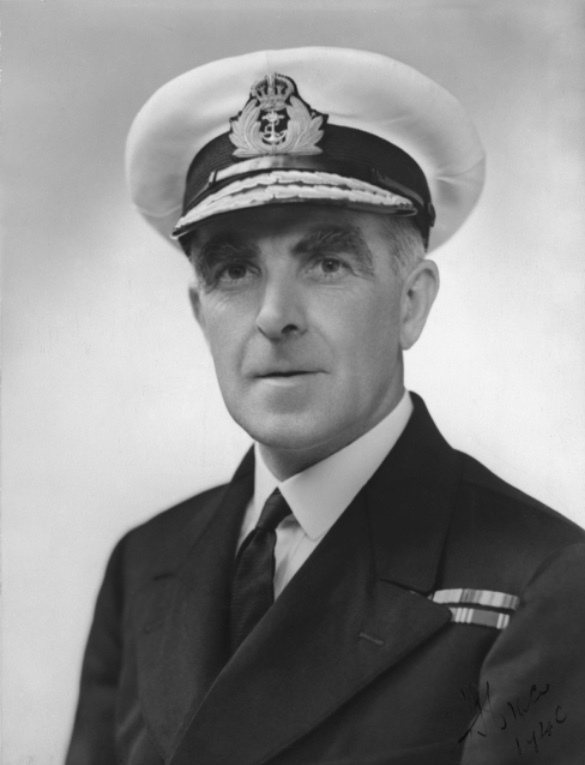 Captain Harold Farncomb, RAN, was captain of HMAS Australia during the Battle of the Coral Sea. After the departure of the low level attackers another wave of aircraft attacked Crace's squadron. These were high level bombers which seemed to single out Australia for the other ships were completely obscured from view by the rising water columns made by a large number of near misses. These aircraft were followed by yet another high level raid. This last group of attackers were later identified as American B17 bombers. Fortunately their bombing, as was most high level bombing against moving ships, proved to be ineffectual. The skilful shiphandling of Crace and his commanding officers also contributed to the safety of the ships. Following these attacks Crace continued to patrol the area of the Jomard Passage. On their return to Rabaul the Japanese airmen reported that they had sunk a battleship and damaged a second and a cruiser. As a result of the inaccurate battle reports no further strikes were launched against Crace, from Rabaul. Crace was now free to intercept the invasion force, when, as expected, it emerged from the Jomard Passage. However, Admiral Inouye had ordered the Moresby invasion force to reverse course whilst the situation with regard to the 'battleship' sightings was clarified. Had Crace's ships been with Fletcher's carriers the invasion force would have been able to proceed onto Port Moresby. The movements of the various units involved in the Battle of the Coral Sea. At the same time as Crace had been spotted, the Japanese had commenced to launch, from the aircraft carriers Shokaku and Zuikaku, a 78 plane strike against a reported American carrier and cruiser sighted to the south. About an hour later a second report arrived advising the Japanese that an American carrier and about ten other ships were sighted 280 miles to the north west. As it was too late to recall the strike all that Rear Admiral Tadaichi Hara, commander of the 5th Carrier Division, could do was wait for the return of his aircraft. The two American ships were located at 09:54 and the Japanese immediately realised their error. They were about to attack the oiler Neosho and the destroyer Sims. During the course of the attacks that followed, Sims was sunk whilst Neosho was severely damaged. She was later sunk by torpedoes and gunfire from USS Henley after Henley had embarked her survivors. While the Japanese were shadowing Crace and preparing to attack Neosho and Sims, the Americans were attempting to locate the Japanese carriers. At 08:15 a sighting report was received indicating that a force of two carriers and four cruisers were 235 miles northwest of the Americans. This report was, unfortunately, inaccurate as what had been sighted were two cruisers and some minor craft. However, acting on this report Fletcher immediately launched a strike of some 90 aircraft from both carriers. It was after the last of the aircraft were launched that the error was realised; however, Fletcher decided to let the strike continue. At 10:22 a message was received that land based aircraft had spotted a carrier, Shoho, and other ships a few miles north of Misima Island. The outbound strike was then redirected to the location of Shoho. When sighted by the American aircraft at around 11:00, Shoho and her consorts were in an area of clear weather with excellent visibility. Shoho had not been able launch any aircraft at this stage because she was in the process of refuelling her fighters which had been flying reconnaissance missions. As Shoho was later turning into the wind to launch her aircraft the main American attack, which was delayed whilst the slower torpedo bombers arrived, started. 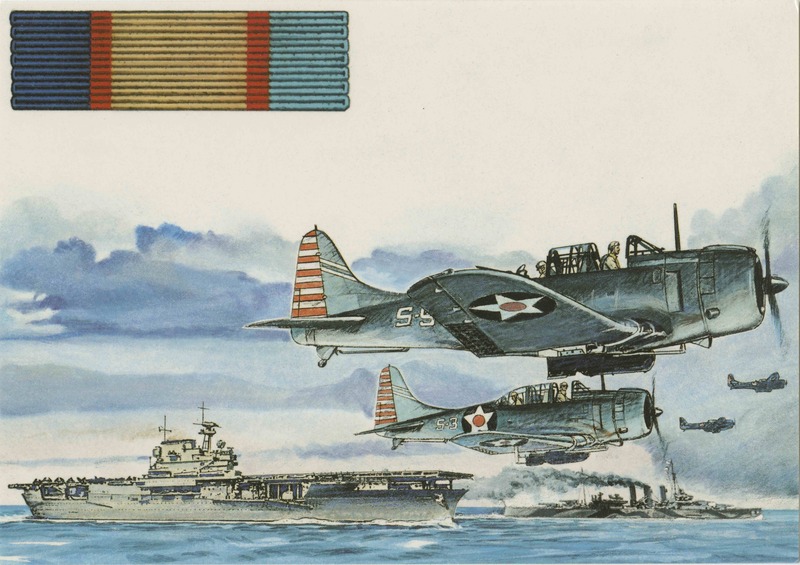 Lexington's dive bombers and torpedo bombers made a co-ordinated attack followed almost immediately by Yorktown's dive bombers. 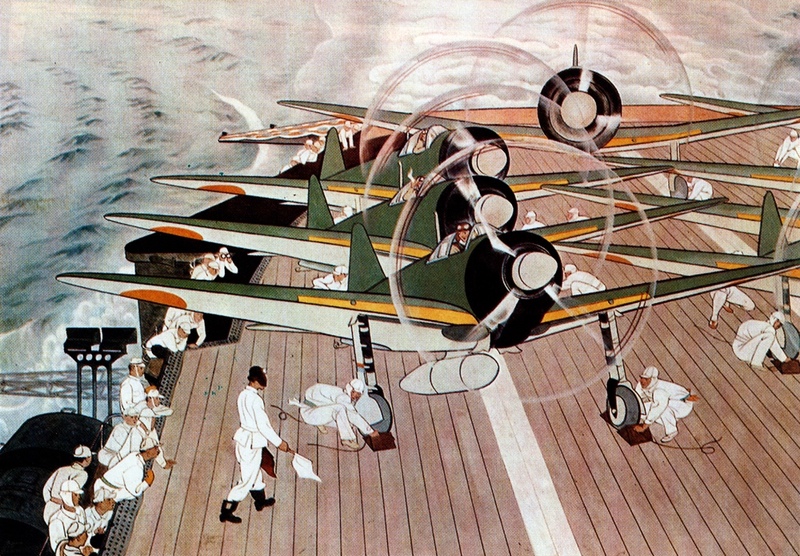 By the time Yorktown's torpedo aircraft arrived Shoho was already doomed. Unfortunately, instead of attacking the other Japanese ships they continued the attack on Shoho, which eventually received approximately 13 bomb and seven torpedo hits. Not one other Japanese ship in the group was damaged. Japanese warships Shokaku (left) and Shoho (right) coming under bombing attack. By 13:35 the Americans had recovered their aircraft and Fletcher was debating whether to launch another strike against the remaining Japanese ships; however, he decided against this on the grounds that the other Japanese carriers still had not been located. Later in the afternoon Fletcher learnt of the attack on Neosho, but again an incorrect position had been given. Meanwhile Admiral Tagaki, on learning of the attack on Shoho, was powerless to act because of his earlier decision in attacking the incorrectly reported Neosho and Sims. However, once his aircraft returned, Tagaki decided to launch a late afternoon strike against the American carriers, though he had no firm idea as to their position. For this attempted strike, Tagaki selected his most experienced aircrew, mainly as the aircraft would be returning in the dark. The 12 dive bombers and 15 torpedo bombers launched in three groups at 16:30 hoping to locate and attack the Americans at dusk. As it was, they could not locate the Americans and jettisoned their ordnance for the return flight. On the return flight one group of Japanese almost flew over the top of the Americans, and failed to see them; however, the American carriers were using their radar to good effect and intercepted the returning Japanese. In the ensuing melee eight Japanese were shot down for the loss of three Americans. But more importantly, from the Japanese side, Tagaki had lost eight (almost 10%) of his most experienced aircrew. Two other groups arrived at where they thought their carriers were and commenced a search. When three aircraft saw a carrier and attempted to land after giving the correct recognition signals, Yorktown's gunners opened fire and the aircraft retired. All in all, only 18 aircraft returned to the Japanese carriers. Later that night both commanders contemplated sending their surface ships out to attack the opposing carrier force, and both rejected the idea because they expected attacks the next morning and needed the ships to provide additional anti-aircraft firepower. On the morning of 8 May both sides were to locate their opponents almost simultaneously. At 09:00 the Americans commenced launching their aircraft whilst the Japanese commenced at 09:15. Both the Japanese and Americans passed each other as they headed for their respective targets. The heavy cloud, which had dogged the entire operation, prevented any sightings. The first American aircraft, dive bombers from Yorktown, arrived over the two Japanese carriers, which were operating as separate groups, at 10:30. They had to wait another ten minutes for the arrival of the slower torpedo bombers before commencing an attack. At 10:57 Yorktown's aircraft attacked Shokaku; Zuikaku had managed, in the meantime, to hide in a rain squall. Again the inexperience of the American aircrew showed, with bombs and torpedoes generally being released too far away. Shokaku managed to avoid all the torpedoes that were fired at her but she was hit by a number of bombs. The damage done and fires started prevented her from launching aircraft. Only part of Lexington's strike arrived due to difficulties in locating the targets in the squally weather. After they arrived they commenced to attack the Japanese carrier. While the American aircraft were commencing their attack on Shokaku the Japanese were detected by Lexington's radar at 70 miles and closing. At this stage there were only eight fighters in the air, all short on fuel, with a further nine aircraft having just landed on Lexington and in the process of being refuelled. Perhaps because of the fuel problem, or inexperience, the fighter direction officer in Lexington placed the combat air patrol too close to the ships and at such an altitude that they were below the dive bombers and above the torpedo bombers. In either case, they could do little to break up the Japanese attack which commenced at 11:18. Two minutes later Lexington was hit on the port side forward by a torpedo and then a second hit opposite the bridge. The dive bombers arrived after the torpedo bombers and scored at least two hits and several near misses. As a result of these attacks, fuel tanks were ruptured and the ship was on fire in at least four places, and developed a 6 degrees list to port. The end of USS Lexington. Left: rocked by an internal explosion, and right: destroyers in attendance before the carrier was sunk. Yorktown was also attacked by the Japanese but managed to avoid the torpedoes, which were launched from only one side, but was hit by one bomb. This bomb hit reduced Yorktown's speed to 24 knots. At about 12:30 the American strike group began to return. Shortly after this Lexington was rocked by a large internal explosion caused by the build up of petrol fumes. This explosion started new fires which were fed by oil and other flammables. This fire gradually spread and at 17:07 the order was given to abandon ship. Lexington was finally sunk by a torpedo from the destroyer Phelps. With the last of Lexington's aircraft onboard Yorktown the remainder of the force withdrew to the south and thence to Pearl Harbor. Fortunately for the Americans the Japanese were not in a position to take advantage of the loss of Lexington. Shokaku was so badly damaged that she had to return to Truk for repairs before going onto Japan. An entry in the FRUMEL records for 10 May gives her intended itinerary for the return voyage with the comment "Looks like a reasonable submarine target". A warning of what was to come for the Japanese merchant fleet. The second carrier, Zuikaku, was low on fuel and had less than forty serviceable aircraft left. As a consequence of this Admiral Inouye ordered the Moresby invasion postponed and the ships to retire. Admiral Yamamoto however, ordered Tagaki and Goto to pursue the Americans. The Japanese broke off the search on 11 May. Due to the insufficient allocation of forces Yamamoto had missed his chance to destroy a large proportion of the US Pacific Fleet. 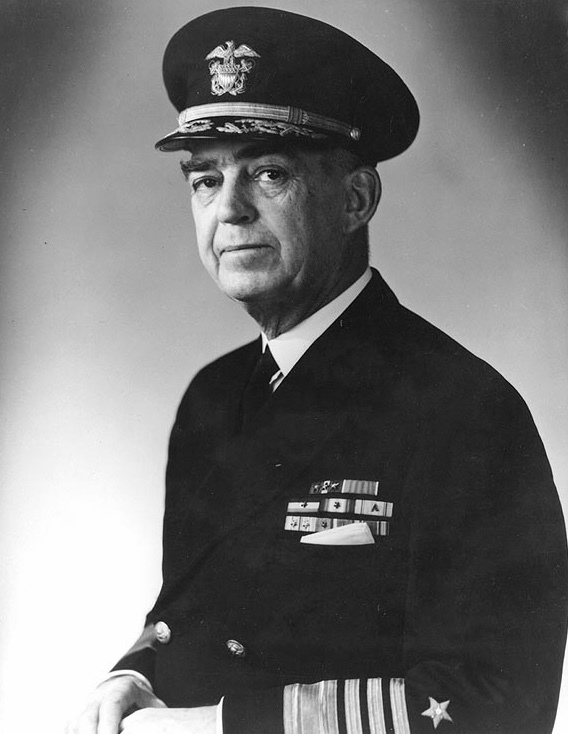 Admiral Fletcher returned with Yorktown to Pearl Harbor where battle damage was made good and the carrier prepared for the forthcoming Battle of Midway. Admiral Crace, who had spent the last few days blocking the approaches to Port Moresby, was apparently not advised of the end of the battle nor of Fletcher's departure from the area. Crace departed the area on the 10 May and sailed for Cid Harbour to refuel from the Australian oiler Kurumba. Shortly after arriving at Cid Harbour he received a signal from Fletcher acknowledging his services in the battle. Finally on 18 May staff at FRUMEL intercepted and decrypted a Japanese message which indicated that the Japanese had given up attempting to capture Port Moresby by seaborne assault and intended to mount an assault overland. Both the Japanese and the Allies have portrayed the Battle of the Coral Sea as a victory. In a sense they are both right. 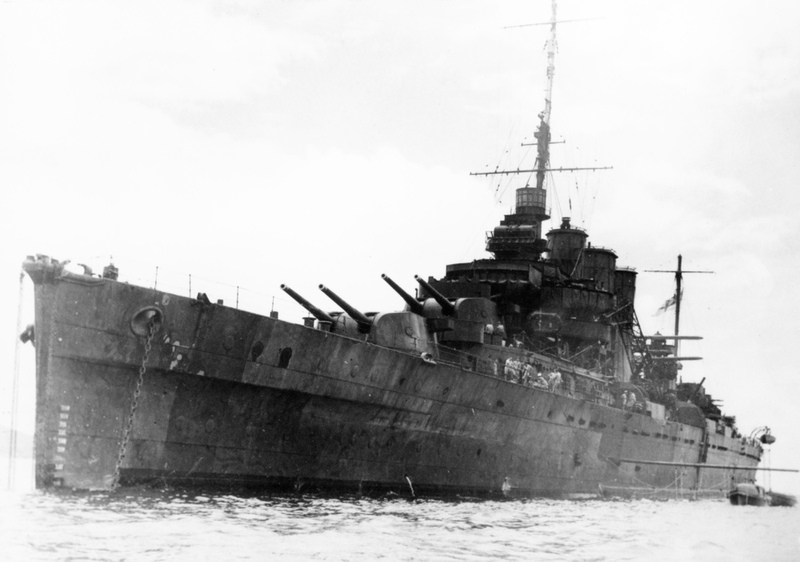 On the Japanese part they managed to sink more American ships than they lost, whilst the Allies not only prevented the Japanese from achieving their objective, the occupation of Port Moresby, but also reduced the forces available to the Japanese for the forthcoming Midway operations. Against this, on the part of the Americans, must be weighed the fact that the Japanese assault forces remained intact and all that had actually stood in the way of the Japanese and the capture Port Moresby were Crace's cruisers. Fletcher's carriers, which were engaged in trying to locate and destroy the Japanese carriers, were too far away and too busy to provide any opposition or support if required. The decision by Fletcher to weaken his forces by detaching Crace had proved to be the correct one, even though this may have contributed to the loss of Lexington. The Royal Australian Navy's overall contribution to the Battle of the Coral Sea may not have been as spectacular as that of the American carriers, but the work done by the coast watchers, intelligence staff, the cruisers and other support ships and personnel all contributed to the final result, not just at the Coral Sea but throughout the Pacific War. Whilst Australians today may scoff at the fears of a Japanese invasion during 1942 the fact is that for many Australians during the 1940s that fear was real.